The next time you’re looking for a little inspiration — whether it be for a bit of soul-searching, to tease your wanderlust, or simply for a little reassurance that the world is a beautiful and wondrous place — visit a treehouse. Make no mistake, these verdant getaways are not what you’d experience shimmying up the tree in your backyard; they are world-class beauties in the treetops, replete with modern amenities, astonishing views, and the ability to bring out the gleeful kid in the most stressed amongst us. The following luxury treehouses will possibly get you scheming for a quick getaway — proceed at your own risk. The Blackthorne treehouse is located near the wild beauty of the Point Reyes National Seashore in northern California. No tiny accommodations here; this expansive beauty has six bedrooms, including one with floor-to-ceiling windows. It’s easy to envision a family retreat or workshop here. The architecture floats among the treetops, both expansive and secluded. The interior details are reminiscent of the local history and nature: you’ll see doors salvaged from San Francisco’s old train station at the entrance to the atrium (which connects to the 20-foot high ceilings that elevate the treetop experience even more), and a handmade spiral staircase made of local cedar leads up to the bedrooms. Secluded on the Clowance Resort, this round treehouse features lovely exterior details with just the right amount of rustic. Lucky occupants can soak in the outdoor copper bathtub, relax on the deck that surrounds the treehouse, and dine at the bespoke round timber table. Both bedrooms are surrounded by light, and the central living area makes it suitable for more than one person. The domed ceilings arch high above you, showing the incredible construction of the space, and nothing could be better than relaxing in the open-plan living area while making plans for the day’s adventures — even if they simply include a glass of wine and bird-watching on the deck. Woven from the trees themselves, The Nest is as close as you’ll get to the birds. Located in the Rhône-Alpes region of France, it provides lucky guests with mountain vistas that lie just beyond the branches surrounding this treehouse. With a wood pellet stove, a private rooftop viewing area among the native spruce trees, and extraordinary night sky views, this treehouse is perfect for a secluded getaway that doesn’t neglect the amenities. It sleeps two adventurers and is an ideal retreat for lovers of snowshoeing and hiking, both of which can be done in the surrounding area. Nestled in the ebony trees along the Zambezi River, the Tree House at the Tongabezi Lodge is every bit the exotic, mosquito net-draped fantasy you’d expect — only with luxuries such as air conditioning and WiFi. From their perch, guests can take in the River’s surreal and lovely sunset views. Here one can soak in the perfect clawfoot tub while being serenaded by the night sounds of the Zambian countryside. Tree trunks and branches are incorporated directly into the design of the room. The polished wood floors invite bare feet and relaxation, and this treehouse is completely open on the front façade, evoking those life-in-the-trees vibes. Taking architecture and whimsy to the maximum, the Pinecone Treehouse is a stunner. Built by an architectural firm that specializes in green treehouse designs, the Pinecone suspends guests among the trees and provides 360-degree views. The intent of the designers was to immerse the occupants in nature. This structure, accessed by an aerial path, delivers. 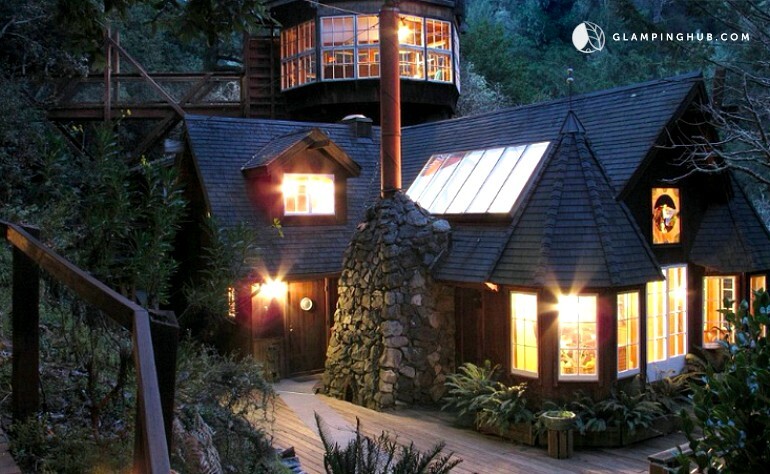 It’s a glass-encased wonder in the Redwood forest, fitted out with simple and serene amenities for two people. It’s hard to imagine a better place to recharge and contemplate than this canopied treetop oasis. Shannon Magee is a freelance writer who lives in the American Ozarks and travels as much as possible. She writes about interior design, gardening, and natural history as she juggles an equestrian lifestyle with a writer’s salary. She is also the enthusiastic content strategist for Vancouver Woodworks, a solid wood furniture retailer.